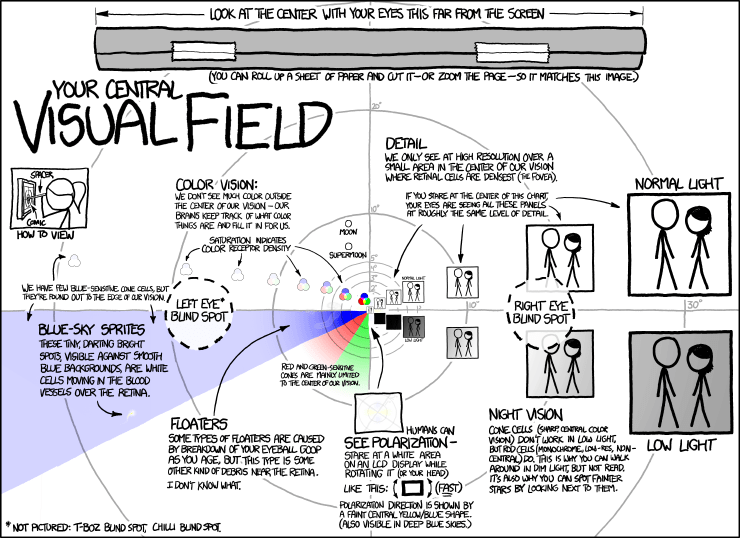 How many megapixels is the human eye? from Brainiac. Close your left eye and stare at the +. Move your head closer to the screen and keep staring at the +, but pay attention to the dot. What happens? Explain why. Explain it yourself first, then check at Serendip’s great website. The solution and loads more perception demonstrations can be found at Serendip’s playground. Blind Spot illusion. Close your left eye, focus on the small dot. Do you see the large dot disappear? From Richard Wiseman’s blog. 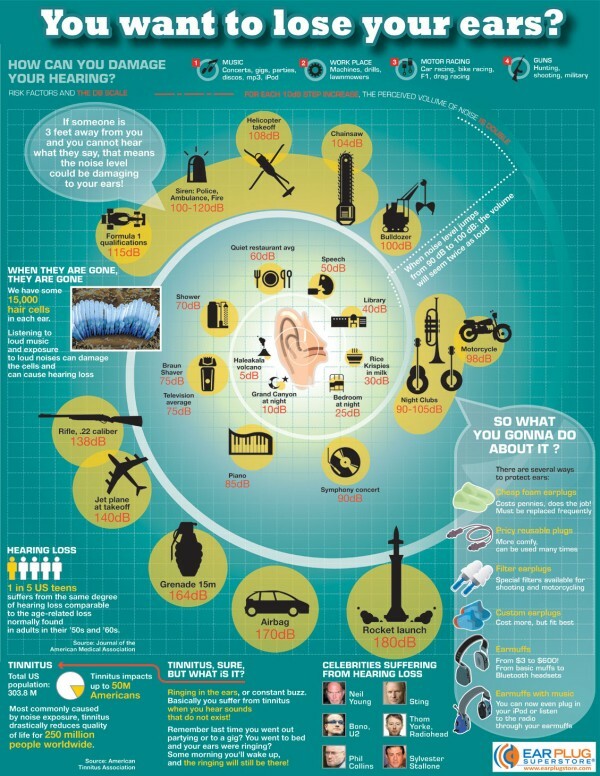 How do some blind humans use echolocation to get around? Can violinists tell the difference between a new, expertly-made violin and a classic Stradivarius? This article by Ed Yong outlines a neat experiment which is a good example of double-blind testing as used in medicine. The Mantis Shrimp’s amazing visual capabilities, from NotExactlyRocketScience. Is the Mantis Shrimp the coolest animal ever? If you watch this TED Talk on measuring the fastest animals on Earth, you will agree. With the forensic developments of DNA profiling and analysis, we see a move to more reliance on empirical scientific evidence in criminal cases. In recent news stories, many convictions based on eyewitness testimony have been overturned by new DNA evidence. Why are eyewitness testimonies so notoriously unreliable? The Innocence Project outlines some of the reasons why eyewitnesses get it wrong. TruthInJustice outlines some overturned cases, and this academic paper from Durham University outlines the UK’s first exoneration due to DNA evidence – which shows a whole range of forensic evidence in use. Does taking a photographs impact your memory? This article on The Guardian looks at a paper on the effect of taking photos on the photographers’ memories of the objects, with some interesting caveats/ prompts for discussion. Here is Pawan Sinha talking about how the brain learns to see, and how we can help the children who are born blind in India. Find out more about Sinha’s work and Project Prakash at his university website (MIT). How do other animals perceive nature? Interactive sliders from Nautilus magazine. The ‘blue’ and ‘green’ are the same colour! In this article from NotExactlyRocketScience, Ed Yong explains that the size of your brain’s visual cortex (which is incredibly variable between people), affects how you see the world – including how likely you are to fall for optical illusions. This one is the Thatcher Effect Illusion. 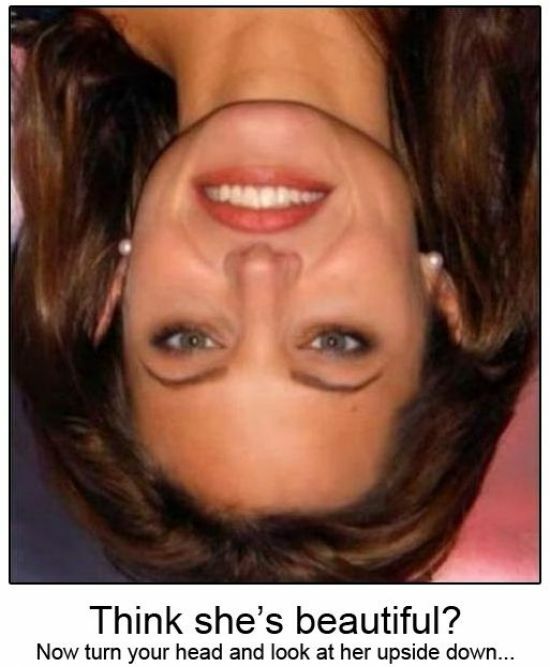 Is Angeline more beautiful this way or upside down? 2008 Illusion of the Year by Lier and Vergeer @Neuralcorrelate. Stare at the dot and see what happens to the colour of the shapes when they turn white. Click on the image to go to the competition finalists website and then settle in for a few hours.